This month’s Palm Springs Life’s home feature, “The Road to Fame and Fortune,” by Greg Archer (www.palmspringslife.com) opens with one of the area’s most famous homes, the Kaufmann House, a 1946 glass, steel and stone landmark designed by architect Richard Neutra. The home has twice been at the vanguard of new movements in architecture: First by helping to shape postwar Modernism and later, as a result of a painstaking and expensive restoration in the late 1990s, spurred a revival of interest in mid-20th century homes, according to a New York Times review by Edward Wyatt (www.nytimes.com/2007/10/31/arts/design). This house continues to make news as an important landmark. Plans are underway for the 10th Anniversary of the “Great Alexander Weekend” in Palm Springs, March 26-27, 2011. The Palm Springs Preservation Foundation (www.pspreservationfoundation.org ) is planning a full weekend of home tours, seminars, cocktail receptions and special tributes to one of Palm Springs’ most influential and innovative home builders. The Great Alexander Weekends and PSPF’s tribute book, When Mod Went Mass, have garnered significant awareness of the Alexander-built tract homes by architect William Krisel, and helped leverage even more importance to the genre of Mid-Century Modern homes, commercial and public buildings which are prevalent throughout Palm Springs and the Coachella Valley. Thunderbird Heights is a gated hillside just across from Thunderbird Country Club. The neighborhood, established in the 1950’s, offers a diverse mix of classic Mid-Century Modern homes, remodeled classics, and new construction, most of which were built in the sixties and seventies. Centrally located in Rancho Mirage makes Thunderbird Heights a very desirable neighborhood. Rancho Mirage’s restaurant row is just down the road, and the popular River shopping dining and entertainment complex is nearby. Most homes have panoramic valley and desert views with large lots and living quarters. This neighborhood was once the tramping ground of the “Rat Pack”, Frank Sinatra, Dean Martin, and Sammy Davis Jr., and was known as the Beverly Hills of Palm Springs. In the 1950’s Los Angeles celebrities used Vista Las Palmas as their desert retreat. Vista Las Palmas is a quiet neighborhood west and within walking distance of downtown Palm Springs. Situated by the San Jacinto Mountains it is cooler in the summer and warmer in winter. Architect William Krisel is responsible for the design of most of the Alexander homes. 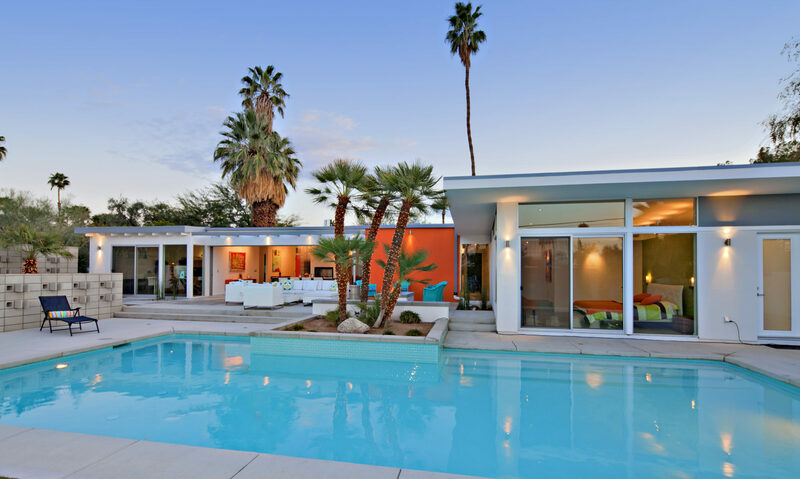 Alexander Construction, owned by George and Bob Alexander built more than 2000 homes in the Palm Springs area, responding to the growing demand for Modern Architecture. Vista Las Palmas was largely developed by them during the 1950’s & 1960’s. The original Alexander homes were $19,000, had no insulation and were built on a concrete slab. Alexander construction characteristics are clerestory windows, post & beam construction, center halls and large lots. This architecture became known as Southern California Modern, with roof styles that include butterfly roofs low-gabled roofs and folded plate roofs. You can also find double A-frame homes called “Swiss Misses”, in Vista Las Palmas, designed by Charles Dubois. Vista Las Palmas embodies the Mid-Century Modern taste for the discriminating homeowner seeking the desert lifestyle of the desert close to downtown. Most of the homes were built by Alexander, and many have been restored or modernized with rapidly increasing prices. Robert (Bob) Alexander & his wife, Helene, lived in Vista Las Palmas at 1350 Ladera. It was “The Home of Tomorrow” featured over eight-pages the September 1992 Look Magazine. The $300,000 cost set a new standard in Southern California. Elvis & Priscilla Presley used it in 1968 for their honeymoon. In 1965, George & Robert Alexander and their wives died in a plane crash northwest of Indio. Their work lives on in Vista Las Palmas. Tamarisk Rancho is a premium neighborhood located in the heart of suburban Rancho Mirage adjacent to the Tamarisk Country Club. There are two clusters of 16 Mid-Century Modern homes enclosing groomed, park-like green belts with tranquil views of mature fruit trees and date palms that may predate the development. The 45-foot swimming pool at the center of this private oasis in the South cluster was advertised in 1958 as “one of the finest in Palm Springs.” It was the scene of al fresco cocktail parties hosted by the likes of Barbara Sinatra, Groucho Marx and other Hollywood talent from in front and behind the camera. Tamarisk Rancho is architecturally significant as a well designed and intact example of a property type apparently unique to Rancho Mirage and the Coachella Valley area. These are planned unit developments of privately owned single-family residences sharing grounds and a swimming pool (a Cooperative).